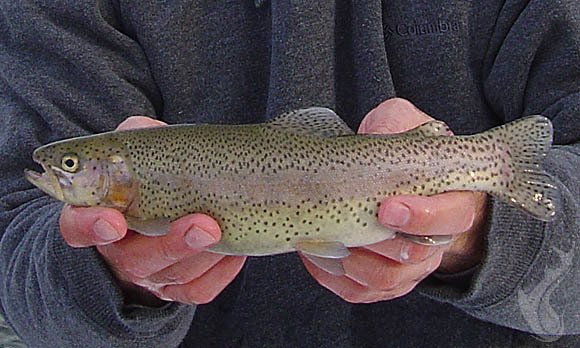 CASTALIA, OH – It’s that time of year again when the ODNR releases Rainbow Trout (10 to 14″) throughout Ohio. This is a ‘put & take’ type fishery that can be a lot of fun. I’ve actually managed some larger fish, possibly a few brood stock released or the inadvertent carry over that isn’t expected to happen. Dates/locations can be found here. Catching these fish usually isn’t too complicated but depending on conditions and how soon you arrive after the stocking, it can be very easy or a bit challenging. If I have reason to suspect it will be an easy day, I always try to include an invitation to someone who doesn’t fish or some kids as it is an excellent way to introduce others to fishing. I am a little puzzled at times when I see adults grabbing a prime location and having their lines in the water practically on top of the release site. This doesn’t seem too sporting. The fish can be taken a variety of ways with some of the most popular being Powerbait and corn. Others will throw inline spinners or flies and plenty of fish get taken on worms and minnows. I usually have a few options with me, in case one isn’t working. Along with the trout stockings, there is a Castalia Trout Fishing Lottery. The annual application period is March 1st – March 31st each year. It has become an annual rejection for me as I have never won and have applied every year of the lottery’s existence. I want to note this includes the rejection of a few family members and friends who would be willing to take me as a guest, if they won. A person might wonder why I would publicize the lottery increasing my odds of failure, but the funds raised do benefit the ODNR so I will sacrifice the odds to see them raise more money. The lottery information can be found here. Good luck! *UPDATE* While hardly unexpected or newsworthy, my rejection for 2016 was confirmed. A common saying from the Cleveland area comes to mind, “There’s always next year”. A sure sign of spring is the release of the ODNR trout stocking schedule. Whether you agree in philosophy or not of this type of ‘put & take’ fishing, it is a lot fun and I always see plenty of kids attending the venues where this is done. It allows for some guilt free catch & keep, one of the few times of year where I smoke a good number of fish. The fishing can even be a challenge at times, proving for a little more sport than what one might expect. Another announcement is the Castalia trout fishing lottery. The application process is only open until the end of March each year, so don’t delay. I have never been fortunate enough to win, but always am excited to apply for my annual denial.